Take Exit #48 on the North side of Charlotte for I-485 . 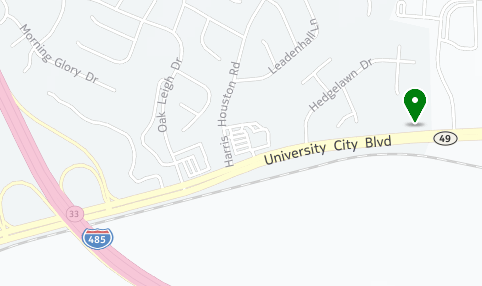 Take the second exit, Exit #33, which is for UNCC / Highway 49. At top of exit turn LEFT onto Highway 49 and head northeast away from Charlotte..
Go approximately one mile and be looking for the church on your LEFT. You will actually have to pass the church and make a U-turn to get back to the driveway entrancedue to the median in the road. We are located at 11431 University City Blvd / Hwy 49. Welcome!. Follow I-485 east to Exit #33, which is for UNCC / Highway 49. At top of exit turn LEFT onto University City Blvd/Hwy 49 and head northeast away from Charlotte and UNCC. You will actually have to pass the church and make a U-turn to get back to the driveway entrance due to the median in the road. We are located at 11431 University City Blvd/Hwy 49. Welcome! Follow Harris Blvd. toward the University Area. Take the Hwy. 49/UNCC exit and at the end of the exit ramp head northeast on Hwy 49 / University City Blvd toward UNCC. You will soon pass UNCC on your left, continuing on Hwy. 49. Two or three miles later you will cross over I-485. Begin looking to your left for the church.